so earlier when I was all "I feel GREAT! I feel FINE!" I was a big fat liar. I'm remembering why I hate Vicodin. Mostly it intensifies that whole "crap" thing tenfold. By the by, vomiting and humongous incision across the abdomen are NOT friends. In fact, I think it would be okay for me to say that they pretty much hate each other. And for those of you who were all "why are you swollen to the size of an elephant?" Well. One, I'm going to assume you haven't had surgery before. And Two, that's pretty much it. When you have surgery, you are hooked up to lots of IV's. Because one musn't eat when one has surgical procedures, but one musn't become dehydrated either. Thus, IV's. Which fill you up with massive amounts of fluid. Your skin looks fab, the rest of you? Not so much. Then, when they actually cut you open, AIR gets trapped inside you. LOTS and LOTS of AIR. And sometimes, they even put more gas in you to make sure things are moving along. So the combination of being pumped full of liquid plus the mass quantities of air that make their way inside leads to the inevitable BLOWING UP. Hence, elephant status. In other news, DadGuy and the sister slave are concocting some scheme to get her to live out here. I'm all for it, but I refuse to participate on the grounds that I refuse to be blamed for any future incidents this will bring. (I way will because well, WILL) Besides, I'm on the short side of lucid and my opinions cannot be taken seriously at this point. I'll agree to anything if you can just for the love of all that is holy make my head stop hurting. And that's pretty much all I got. P.S. okay, I lied again. I went over the Weblog awards and while I'm not winning, I mean, last place guys? LAST? Ugh. Go over there and vote right now. I SAID NOW. Sheesh. At least make me look like I'm not completely pathetic. Gah. P.P.S. 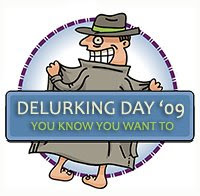 Dudes, did you know it's DeLurking Day? That means you are required by law to leave me a comment that professes your undying love and affection for me. Or at least say "hey howdy hey" you know DE-lurk. It's okay, I don't bite.